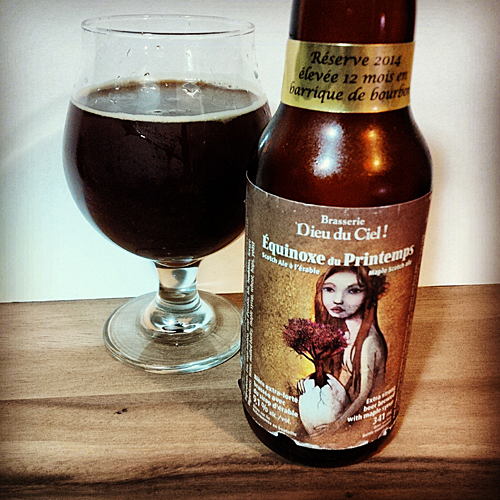 Dieu Du Ciel Barrel Aged Equinoxe Du Printemps Scotch Ale: This is a special Scotch Ale brewed in Quebec to a strength of 9.1% abv which is both infused with maple syrup and aged in bourbon barrels for 12 months. It is brewed once a year in January to be released on the first day of spring to celebrate the Spring Equinox (Equinoxe De Printemps in French translates into Spring Equinox in English), this of course is last years version aged an extra year in barrels. The barrel aged version beer also boasts a top 10 ranking in the Scotch Ale category on ratebeer.com. Aroma and Appearance: It pours muddy brown with hints of foam and some bubbles in the center that are a bit tough to see. The aroma is a wondrous combo maple, vanilla, oak, malt balls, toffee, bourbon, booze, leather and over ripened fruit. Flavour: Very similar to the aroma, at first this malt forward monster of a beer hits with malty toffee, whoppers, vanilla and oak. In the middle of the beer, the maple syrup and molasses shine bringing a real sweetness to the beer that is quickly mellowed by the boozy bourbon. This then leads into an over-ripened fruity finish of dates, plums and chocolate malt flavours. Overall Impression: This is one of those beers that really makes you pause to admire it’s malts and beautiful oak flavours that stand out to make this a fantastic treat. I wish it wasn’t a screw cap bottle though, I am a bit worried about the long term aging prospects of this beer so I plan to drink others within about a year because of that. Rating: I give it an awesome rating of 9/10, delightful beer and cool variation of the style. Food Pairing: I think this should be largely enjoyed on it’s own, however smoked meat or extra sharp cheese wouldn’t hurt. This is a place I want to go visit some day, here’s a recent tap list from their Montreal brewpub!